Credit card (Stripe) - Connect with Stripe to offer secure credit card payments. 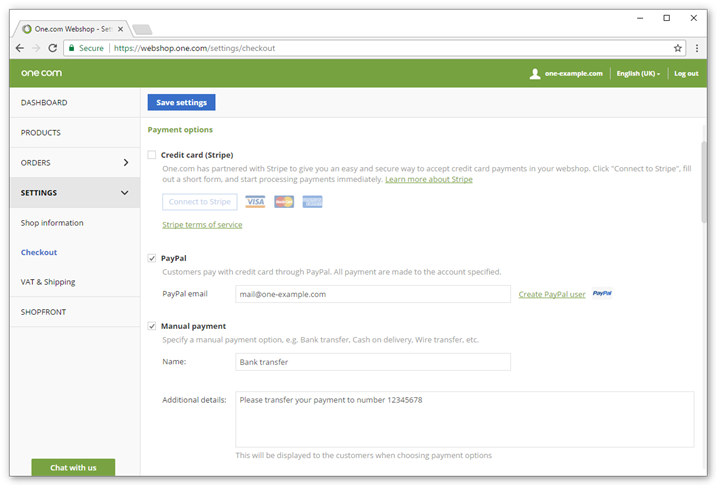 PayPal - Create a PayPal user to allow your customers to pay with PayPal or credit card. Giropay (Stripe) - German customers can pay with Giropay via Stripe. iDeal (Stripe) - Dutch customers can pay with iDeal via Stripe. Bancontact (Stripe) - Customers in Belgium and Germany can pay with Bancontact via Stripe. Sofort (Stripe) - Customers in Germany and other European countries can pay with Sofort via Stripe. Manual payment - Bank transfer, cash on delivery, wire transfer, etc. You need to select at least one option.